Sautéed Shredded Brussels Sprouts, Thyme for Cooking simple vegetables. 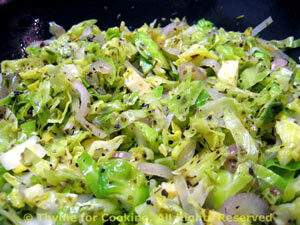 I'm learning that these little green 'cabbages' are very versatile, and the key to good sprouts is to not overcook. Cut each sprout in half through the stem and, then thinly slice. Put into a bowl and fluff - separate the layers. Heat butter and oil in medium nonstick skillet over medium-high heat. Add garlic, shallot, marjoram and shredded sprouts. Sauté until crisp tender, about 5 minutes, stirring often. Add chicken stock, cover and turn heat off. Let sit for 10 minutes. Uncover, turn heat back up to medium and sauté another minute. Finish with a sprinkle of Parmesan and serve.